A former contractor at the Military Sealift Command (MSC) pleaded guilty for accepting bribes totaling approximately $2.8 million in the course of a bribery and fraud scheme that lasted more than a decade. Scott B. Miserendino, Sr. pleaded guilty before U.S. Magistrate Judge Lawrence R. Leonard of the Eastern District of Virginia to an indictment charging him with one count of conspiracy, one count of bribery and three counts of honest services mail fraud. Sentencing has been scheduled for May 8 before Chief District Court Judge Rebecca Beach Smith. Acting Assistant Attorney General John P. Cronan of the Justice Department’s Criminal Division; U.S.
Intellian Technologies, provider of maritime satellite communications and entertainment systems, said it will introduce the v65; a 60cm class Ku/Ka convertible satellite communications system at the Satellite 2017 show in Washington D.C. According to the manufacturer, the v65 is poised to drive adoption of new connectivity solutions in the mobility market by making access to both Ku- and Ka-band on the same antenna system simple and cost-effective. “Conventional antenna technology forces a choice between one frequency or the other. KVH Industries, Inc. announced that Netherlands-based Vroon has extended its contract for KVH’s maritime satellite communications solution, choosing the mini-VSAT Broadbandsm network for connectivity services onboard more than 140 Vroon vessels. The multi-year contract also includes KVH’s IP-MobileCastTM service for news, sports, movie and TV delivery, as well as preventive maintenance checks to ensure peak performance on all fielded systems as part of the KVH OneCare program. The first installations of KVH’s 60 cm diameter TracPhone V7 systems onboard Vroon vessels took place in early 2011, after Vroon conducted a stringent selection process involving 22 different satellite communications providers. Today, more than 140 Vroon vessels employ the KVH mini-VSAT Broadband system onboard. 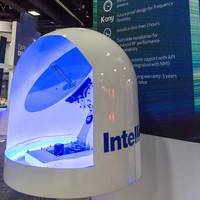 Intellian Technologies, a provider of maritime satellite communications and entertainment systems, has unveiled its latest new product at this year’s SMM show in Hamburg, Germany. The v65, a 60cm class satellite communications system operating in Ku-band, delivers best-in-class RF performance by a substantial margin. The improved performance capability will enable service providers to build new global service plans targeting high volume market segments. The industry has the opportunity to take a closer look at this new offering at SMM, and to learn about its features in more detail. 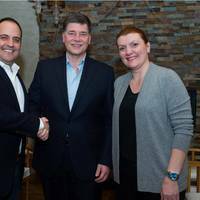 Satcom Global, a maritime satellite communications provider, and Intellian, a satellite antenna developer and manufacturer, have signed a strategic partnership agreement covering the global supply and distribution of maritime satellite equipment. 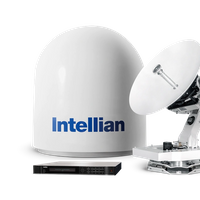 Under the partnership, Satcom Global will have access to Intellian’s full range of Ku-Band, Ka-Band and FleetBroadband hardware, supporting the delivery of its portfolio of VSAT and L-Band services to maritime customers across the globe. Ian Robinson, CEO at Satcom Global said, “Intellian is exactly the kind of committed partner we want on our team to help penetrate deeper into the maritime market with a truly world class managed connectivity solution. 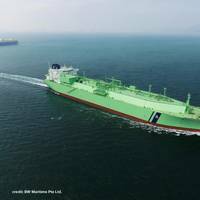 Global shipping and offshore oil and gas operations are increasingly dependent on integrated networks, based on various software and data transfer solutions. Systems and equipment onboard are interconnected, monitored and controlled through an onboard automation network. Onboard systems are increasingly also connected ashore to the owners’ or technology providers’ control centers. 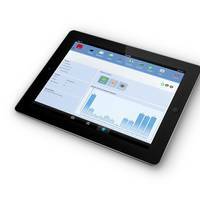 Equipment manufacturers want to remotely upgrade the software of their systems and monitor their use to be able to optimize operations and to scheduled needed maintenance service. 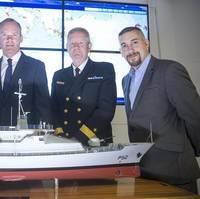 Marlink and Palantir AS have signed a strategic partnership agreement that aims to improve access to IT services in the maritime industry. 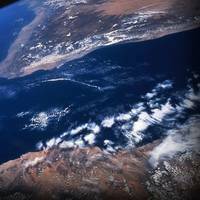 Palantir’s IT products complement Marlink parent company Airbus Defence and Space’s extensive AuroraGlobal multi-band (Ka-, Ku-, C and L-band) connectivity portfolio and value added solutions, which enable shipping companies to optimize communications and operations. Through the agreement, Palantir, a supplier of managed maritime IT products and services will support Marlink in taking increased responsibility for its customers’ IT systems on board. VT iDirect, Inc. (iDirect), a company of Vision Technologies Systems, Inc. (VT Systems), today announced that UK-based independent teleport operator Cobbett Hill Earth Station is upgrading the network of its maritime services unit, ION (International Ocean Services) to the iDirect Evolution 3.2 Platform. The acquisition of maritime satellite communications provider ION in 2013 marked Cobbett Hill Earth Station’s expansion into the commercial maritime market, which according to NSR will hold close to 1 million in-service units by 2023. 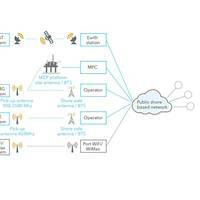 Maritime satellite communications provider Inmarsat says it now connects leisure and fishing vessels with a specially designed broadband service. Accessing weather information and chart updates, keeping in contact with loved ones or simply checking the news are now as simple to do at sea as they are on land with the launch of Fleet One from Inmarsat Maritime. From nnow on, yacht and fishing boat owners can take full advantage of maritime broadband services previously only available to much larger vessels. The three-part series offers information for those researching, implementing, or determining the business benefits associated with offshore connectivity. Given the increasing importance of broadband connectivity for vessels at sea, KVH Industries, Inc., (Nasdaq: KVHI) is presenting a three-part webinar series, “SATCOM 101,” to help explain the sometimes confusing world of maritime satellite communications. Commercial maritime business leaders faced with the need to optimize ship operations and reduce costs, address business challenges of crew retention and piracy, and adapt to regulatory compliance are relying on their IT professionals to provide better ways to support vessels at sea with improved connectivity. Tokyo, Japan, is the Newest Global Location for the Middletown, RI-Based Technology Company. KVH Industries, Inc., (Nasdaq:KVHI) has opened an office in Tokyo to further strengthen KVH's position in the market and to provide additional support to its Japanese partners. The opening of the KVH Industries Japan Co., Ltd., office reflects the growing market in Japan for KVH's maritime satellite communications solutions, which include the mini-VSAT Broadband(SM) service -- the world's leading maritime VSAT choice -- and the award-winning TracPhone(R) satellite communications systems. KVH Industries' Japanese partners include SKY Perfect JSAT Corporation, which provides the mini-VSAT Broadband service under the OceanBB brand name, as well as Furuno Electric Co., Ltd., and Japan Radio Co.
Cobham plc has established a new strategic business unit (SBU) Cobham SATCOM: Thrane & Thrane will form its core. 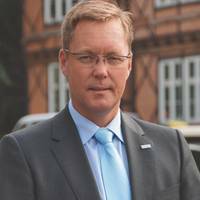 Headquartered in Denmark, Cobham SATCOM is led by Thrane & Thrane CEO Walther Thygesen with assistance from a multinational management team, and includes Cobham’s satcom facilities in Cape Town, South Africa, Concord, California and Orlando, Florida. Cobham SATCOM is now twice the size of what either Thrane & Thrane or Cobham’s legacy satcom businesses were prior to this coambination. Rebranding of Thrane & Thrane will begin immediately and is expected to complete during 2013. In addition to adopting the Cobham SATCOM name and Cobham’s brand, the SATCOM SBU will be rebranding its products throughout 2013. KVH Industries, Inc., has named Boatracs Inc., a leader in integrated maritime satellite communications and software solutions, the first Value Added Service Provider (VASP) for its mini-VSAT Broadband service. This collaboration will deliver an end-to-end fleet management package for the commercial workboat and fishing markets, bringing Boatracs' market leading software applications to vessels via a reliable broadband connection in a single package. Sold under the name "Boatracs Broadband Fleet Management Solution", this innovative package includes a KVH TracPhone® V3 and mini-VSAT Broadbandsm service for global broadband connectivity as well as Boatracs maritime software platforms, Boatracs BTConnect® and Boatracs BTForms™.